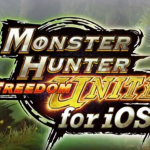 MONSTER HUNTER FREEDOM UNITE for iOS ($14.99) by CAPCOM is the official iOS port of the Monster Hunter game that originally came out on the PSP back in 2008. While the game has been available on iOS in Japan for a few months now, it is now available for everyone worldwide. Is it worth the cash? Let’s find out. I became quite obsessed with Monster Hunter ever since I started playing Monster Hunter 3 Ultimate for Nintendo 3DS with my boyfriend last year. 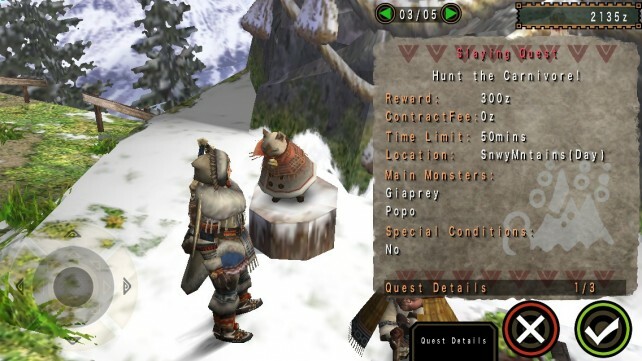 If you’re not familiar with the Monster Hunter series, here’s what it’s all about: you venture out on quests to kill monsters, gather resources, and craft weapons and armor with these resources that you collect. It’s basically about earning, because you have to earn everything in these games. Nothing is really given to you, aside from the basics. Once you begin to earn your keep in the games, you get this feeling of accomplishment, and it’s wonderful. 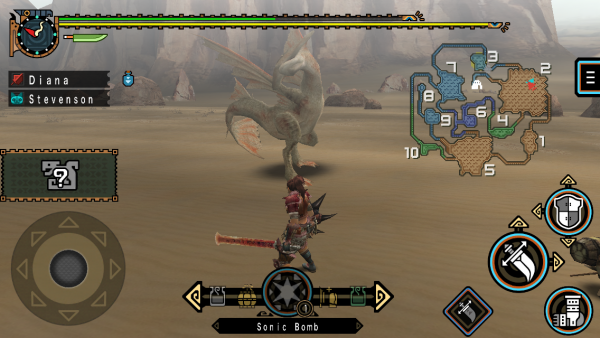 Of course, since I’m coming from MH3U, I was curious about MHFU, as I’ve never played it before on my PSP. If you never played Monster Hunter Freedom Unite, or want to dip your toes into the Monster Hunter franchise, then this is the perfect time to do so. It’s not just another rushed over port of an older game either, which makes it even better. 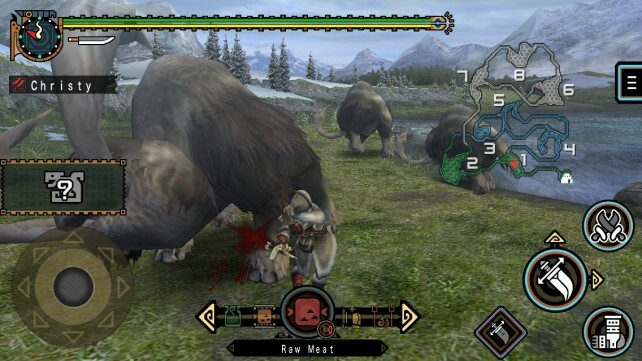 The graphics in MHFU are stunning. Even though this is a game that is around 6 years old at this point, it looks amazing on Retina screens. The graphics are smoother than the original, as the game has been optimized for today’s standards. The game menus are sharp and easy to read, though it may appear better on the iPad due to more screen space (I chose to play the game on my iPhone). The world is lush, vibrant, and filled with incredible amounts of detail, which you can tell from playing and even the cutscenes that show off new areas to the player. Every character is rendered pretty well, with lifelike animations and voices. Since the game is all about hunting and creating weapons and armor items with resources from slain monsters, the cosmetic characteristics of each item stand out quite well once on your character. You just can’t help but feel proud once your hunter is decked out in a full set of armor and an awesome weapon, you know? The soundtrack in MHFU is also quite delightful, as it’s quite an adventurous fare. I’m a big fan of the music in the series, so I love having the game on fairly loud as I play to enjoy it. The sound effects of battle, the town, and the voices are all quite fun and quirky, and it’s just something to expect from the Monster Hunter universe. Like with MH3U, I found the start of the game to be pretty slow. 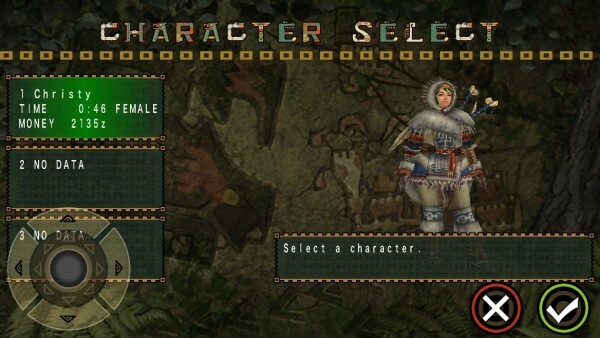 You customize your hunter to however you want him or her to look, and then you will find out that you were rescued by the village chief from a snowy mountain after being attacked by a dangerous creature. You’ll get some basic pieces of armor and weapons, and then embark on fairly easy quests. Quests can consist of gathering specific items or you need to face off against a very tough monster (you can think of it as a lot of boss battles). 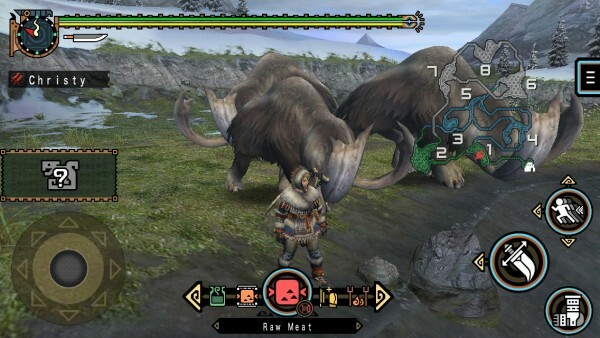 As you begin to refine your hunting skills, you’ll gain access to higher level quests, be able to craft stronger weapons and tougher armor, and even have meals cooked by “Felynes” to gain boosts before tough missions. 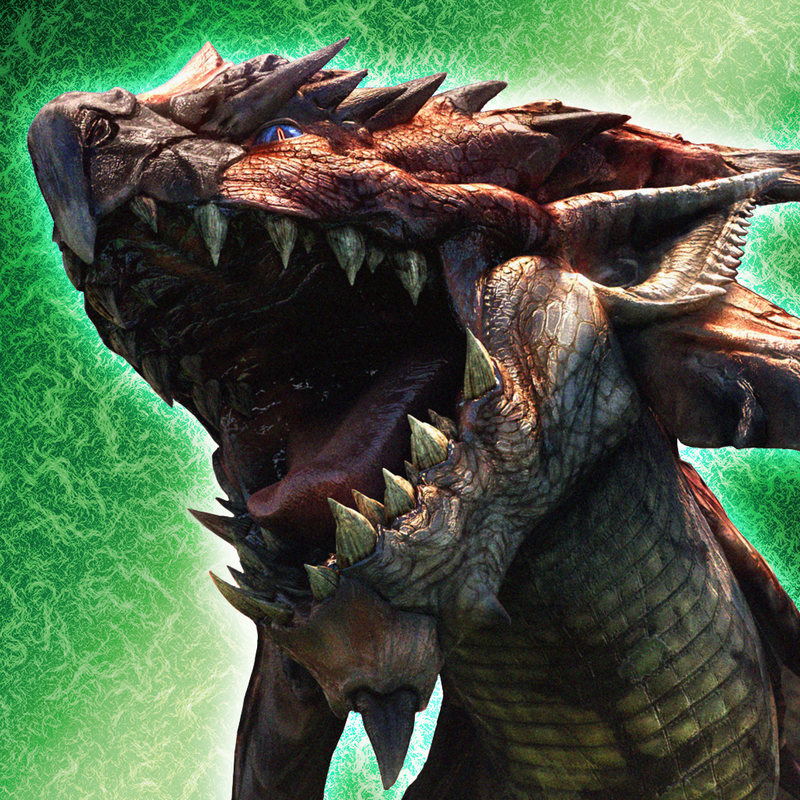 There is just so much to do in the Monster Hunter games, and Freedom Unite is no exception. There’s also a lot of experimentation involved, as you should try out different weapons to find your preferred play style (I’ve preferred dual blades since MH3U), equip different armors for various situations, as well as trying out different meals for certain effects. Now, the biggest thing about MHFU are the controls. When I play MH3U on my 3DS, I actually need the Circle Pad Pro attachment to get the best experience. 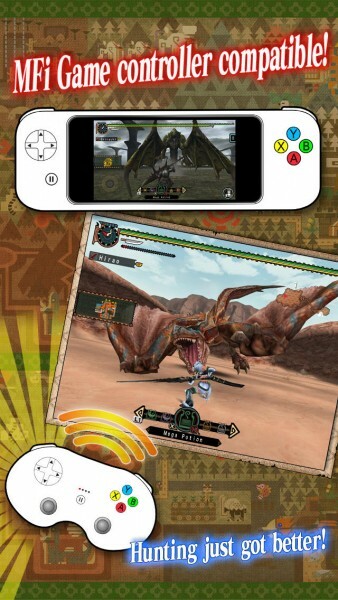 So as you can imagine, I wasn’t so sure that touch controls would work for a Monster Hunter game. Fortunately, they aren’t as bad as I’d imagined. Movement is handled with the virtual joystick in the bottom left. Above this joystick will be a button that can be switched from focusing the camera to what is straight ahead of you, or you can use it to auto-lock onto monsters. The lock-on feature seems to work only for the big monster fights, which makes sense. You can also change the camera angle by swiping your finger around on the screen. 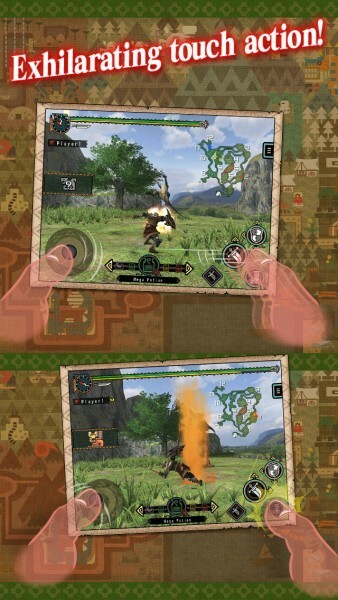 On the right hand side of the screen, you will have three buttons for attacking, rolling, and crouching. The roll button can also be switched to the charge-up attack, depending on your weapon. 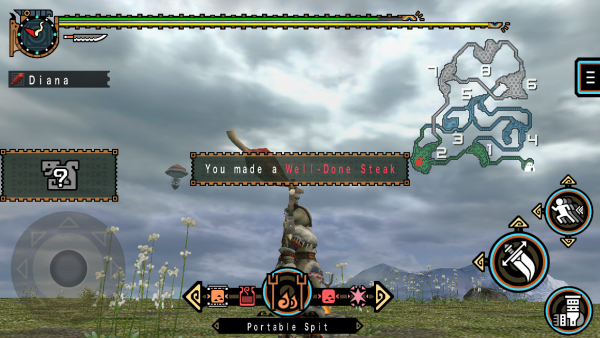 You can also sheath and unsheathe your weapon when appropriate, as well as gather resources from monsters and the environment with the changing button near the bottom corner. If you’ve played Monster Hunter before, then you know how important those items in your inventory can be. 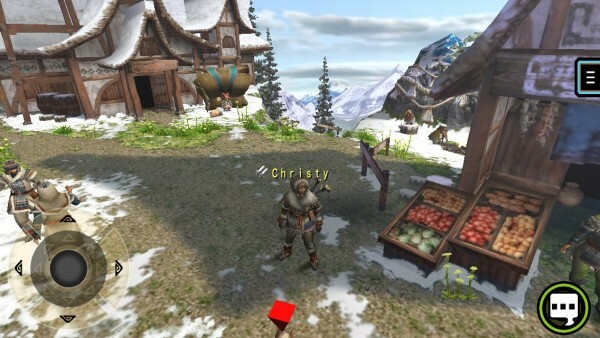 You’ll need potions to regain health and stamina (the green and yellow bars at the top, respectively), a fire spit to cook meat so you can eat it and regain health, whetstones for sharpening your weapon (dull blades are useless), pickaxes for mining, cold and hot drinks for beating the harsh weather conditions, and much more. You can access all of your inventory with the bar at the bottom — scroll through items with the arrow buttons, and then double tap the item you want to use. Personally, I found the controls to be decent, but I did get a bit frustrated with some parts of it. For example, when I tried to move forward in a new sector of the map, my character would run backwards for a second before going in the direction I want. The camera is also pretty frustrating, since it is in weird angles often that obstruct my view of the surroundings. But of course, touch controls are never perfect, and camera angles can always be annoying. I think an important factor when playing MHFU is getting used to the controls, which may take some time. 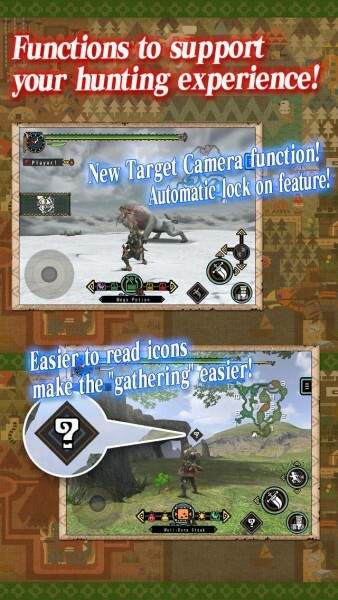 However, if you have a MFi game controller around, you may be able to get an even better experience, since MHFU has full support for these. This game is making me consider getting one, in all honesty. 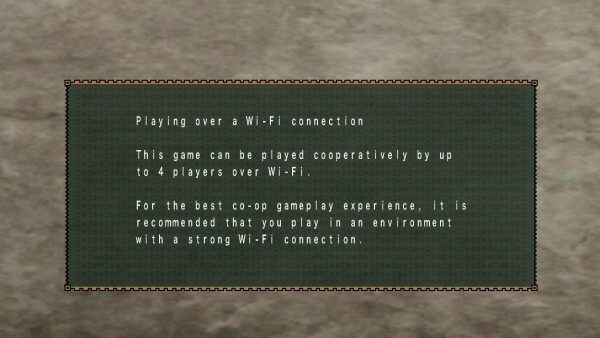 Another thing that makes MHFU amazing is the ability to be able to play with up to three other players over Wi-Fi. That was one of the biggest disappointments I had with MH3U, so I’m glad to see that Freedom Unite has online play. There is also a spiffy chat function to go with it, so you can coordinate with your team on the best strategy to take down a tough monser. 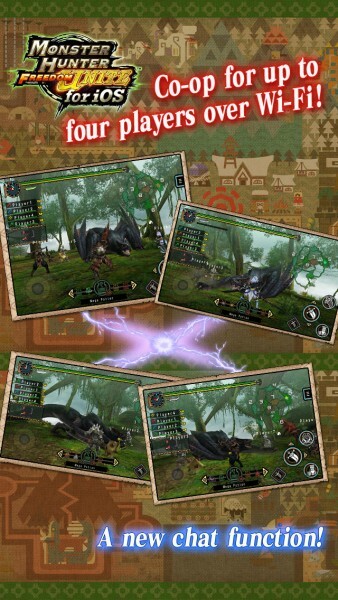 Since Monster Hunter isn’t exactly a game you can just pick up and play for a little, and then put it away (battles can take quite a while), you’ll be glad to know that the game will pause automatically whenever you exit the app or get a call. Unfortunately, if you’re in a multiplayer game, you’ll be kicked out of the group or lobby if a call comes in. 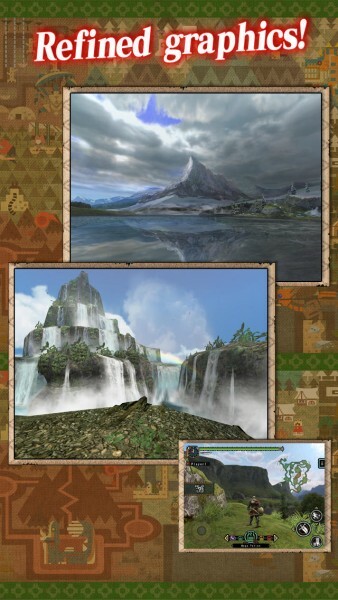 I love Monster Hunter, and I’m definitely glad to see it finally available on iOS. The graphics are stunning, the music and sounds are captivating, there’s so much customization involved, and the sense of accomplishment you get when you take down a huge monster (and reap the rewards) is quite empowering. 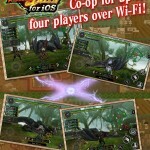 Whether you’re a newbie to the series or a veteran hunter, this is a must-have for your iOS device. 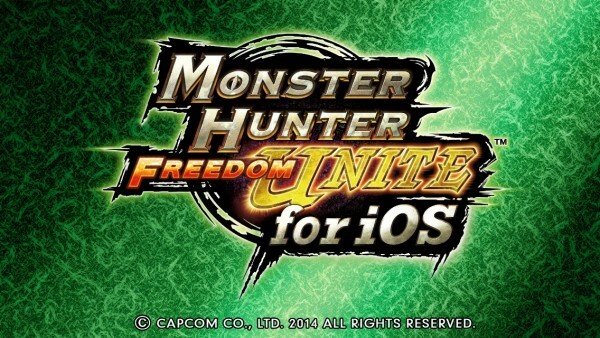 You can find Monster Hunter Freedom Unite as a universal download on the App Store for $14.99.